Military Custom LEGO has really taken off and is getting more and more popular by the day it seems. If I'm typical of the person who has fallen for this, then it's the mix of nostalgia coupled with an obsessive interest in WWI and WWII that makes it such a potent mix. Brickmania are at the forefront of this hobby, making the top range connoisseur kits. They cover WWI right up to the present day. 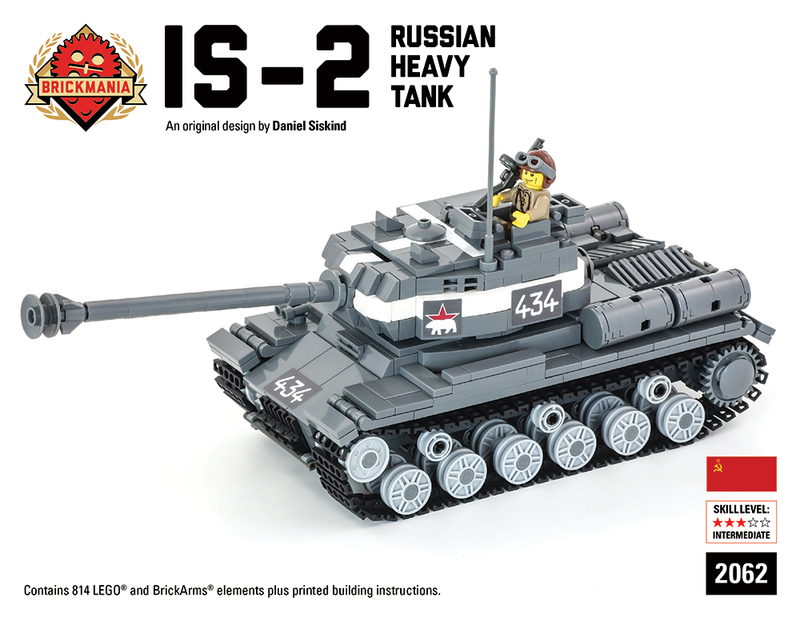 Until in 2008 when a publisher contacted Dan to see if he wanted to author a book about military modelling and LEGO. That is when he found out his previous kits had gained a massive following, alongside a booming market for military custom LEGO! So, by 2009 Brickmania was again alive and well. A year and a thousand kits later Brickmania was booming and has continued at a meteoric pace ever since. They have even opened two shops, one just recently opened. I wonder if we will see Brickmania shops across the globe at some point. I'd love to see them open over here in the UK! First I shall come clean. 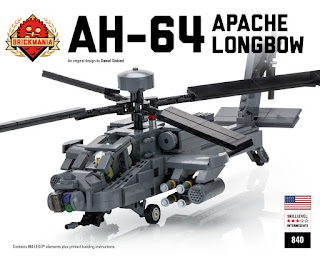 I was offered the new Apache Longbow for review. However, I so wanted a WWII tank as the first kit to review that I asked for the Panzer III instead, to which they agreed. 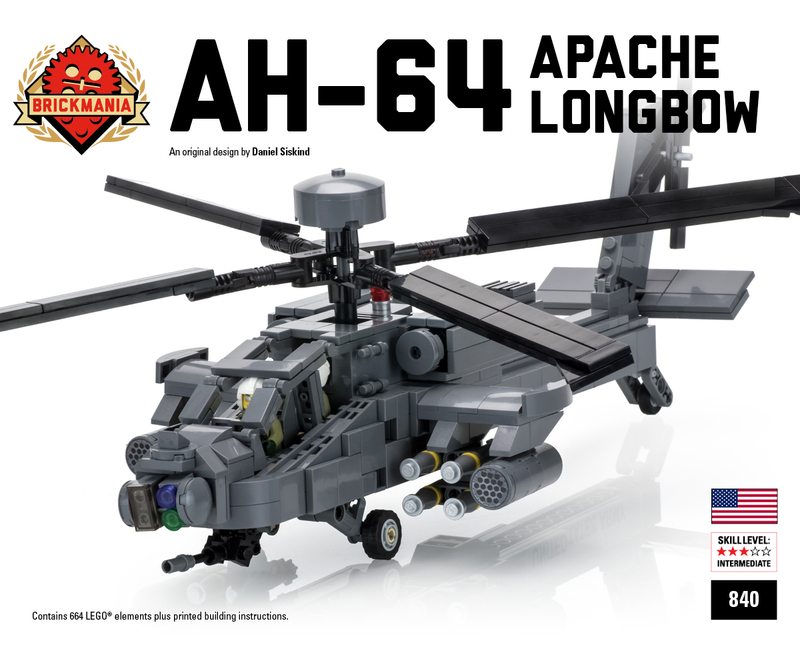 To those who would have preferred me to have reviewed the Apache, I apologise whole heartedly. It does look an awesome kit, and pretty darn big one aswell! If I get the chance to review more Brickmania kits I will not interfere and take what is offered. So now the introduction is over lets move on to the kit, a WWII German Panzer III, that has blitzkrieged across the Atlantic (yes I know, seems abit unrealistic, just go with it) and then invaded my flat, pushing on deep into living room territory, until finally I have it locked in my scissor scopes! 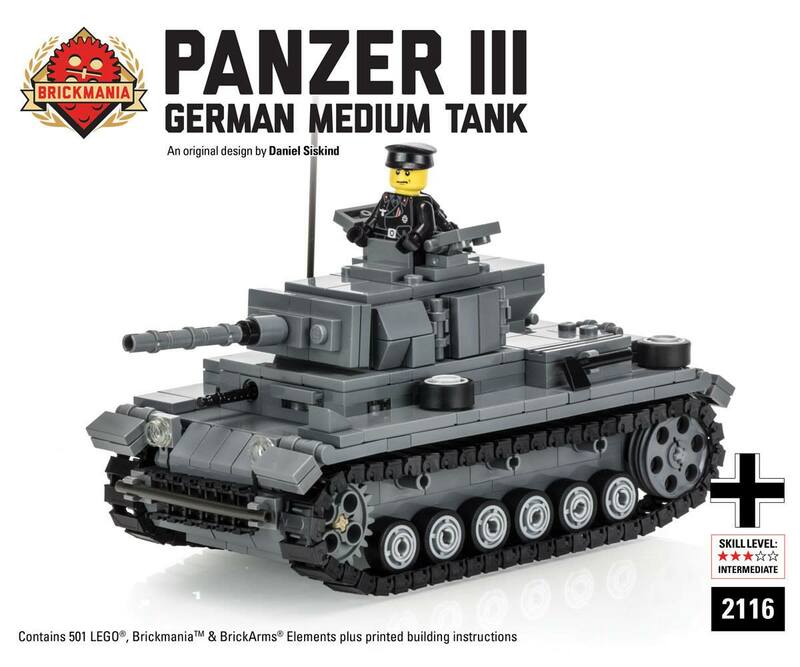 OK, OK..Brickmania Panzer III kit is here to be reviewed, just trying to add abit of flair to the review, I shall get on with it. Anyway, it couldn't have done all that as it needs to be built first, plus it would have sunk, most likely. Sorry, OK, alright, yes I shall get on with it.. The Panzer III medium tank started the War as Germany's main medium tank. This tank was supposed to take on all tanks from all nations. It was the tank Germany relied on in an anti tank role supporting the short barrel Panzer IV designed for an anti infantry role. During the War against Poland and then France it held its own, though training, plus all tanks having radio comms, helped them along the way. However, not far into the invasion of Russia, it came up against the formidable KV-1 heavy tank and the T34 (many say the best tank of the war). The Germans soon realised the Panzer III gun couldn't match either of those tanks and it took superior tactics and skill to be able to manoeuvre and then take these Russian tanks from the side or rear. Soon the Panzer IV was given a long barrel gun and became the main medium tank but the Panzer III carried on, constantly being upgraded, with each new version given a letter at the end. The last Panzer III version [the Panzer III N] was made in 1942 and was given a short barrel and moved into an anti infantry role, though Panzer III's continued to fight across the battlefields of Europe right until the end of the War. Around five thousand seven hundred were built from '39-'43. Though I was a touch nervous with regards to building the Panzer III, I actually really enjoyed the process. I felt far more invested in the end product than if I'd just gone and bought a pre built one or say a die cast model of a tank. There are some fiddly aspects but nothing that caused any major headaches. Plus as the tank slowly came together I could see how much thought must have gone into its design. 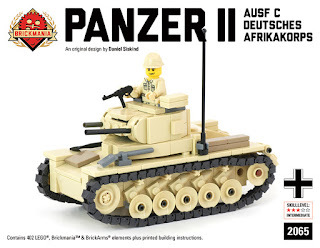 Having to use LEGO pieces already made and not actually making the pieces from scratch for the specific purpose of building a Panzer III it started to dawn on me why the kits don't come cheap. By the end of the build, as I marvelled at its details and how historically correct it looked, I fully understood the reasons behind the price tags. To be able to design these kits and be restricted to LEGO bricks that have already been made for most likely totally different type of builds must take an awful amount of time and I assume frustrations. Add on then having to try and find the bricks and source enough of each type to be able to create a line and we can say the Panzer III must take many man-hours to produce. So, as I said you can see why these kits cost as much as they do. Also it seems it's not just me that can justify the price as the sets seem to sell out fast, and with many kits now passed into the archives people aren't afraid to spend on them, and why not? They look fantastic! I do have to warn you though. Each kit is limited in how many are made. The Panzer III was limited to just 100. Some kits are limited to just 50. So you can't hang about if you want one. It also means they become collector pieces. As for the price I can't remember how much this Panzer III cost as it is sold out and no longer has a webpage, however I remember it being roughly around $290. The finished model stands proudly on the shelf where I put all my favourite miniatures. It has a rotatable turret and you can elevate the gun. The Panzer III comes with a German Panzer commander all kitted out in the black Panzer uniform and proudly sporting an Iron Cross. The print work on the MiniFig is excellent. The commander stands in the commanders hatch. As he stares across the endless, flat Russian Steppe, an overwhelming feeling of melancholy falls upon him. It's difficult for him to see where the steppe ends and the sky begins. "There is no end to this forsaken country" he mutters to himself. Pointing forwards he yells "Move out". "When will this end...." he mumbles.. I believe Brickmania are using new tracks, I can't comment on what came before but the ones here look superb, time consuming to link together, but well worth it! The Tank uses all grey bricks on the whole which is perfect for the German Panzers especially in the first half of the War, when they were all grey before they started using that yellow colour. I believe the Allied tanks do suffer in the colour respect though as LEGO haven't made any green LEGO pieces that could be used to build them. So those too are grey in colour. 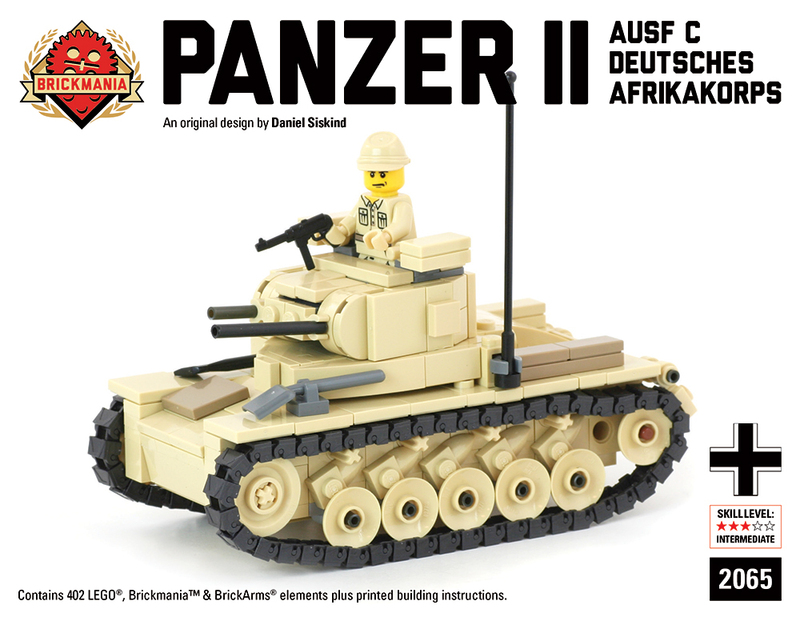 Nevertheless, the WWII desert kits do come in yellow (see Panzer II kit below), LEGO as we know have made lots of yellow bricks, which is perfect for Brickmania! Sadly, I have to end the review with bad news. It seems the Panzer III has now sold out (see I told you they sell like hot cakes). There is currently a DAK Panzer II for sale though. I expect to see a Panzer III return at some point in the future along with all the Axis and Allied tanks of WWII. I do hope we can continue to review Brickmanias excellent kits. 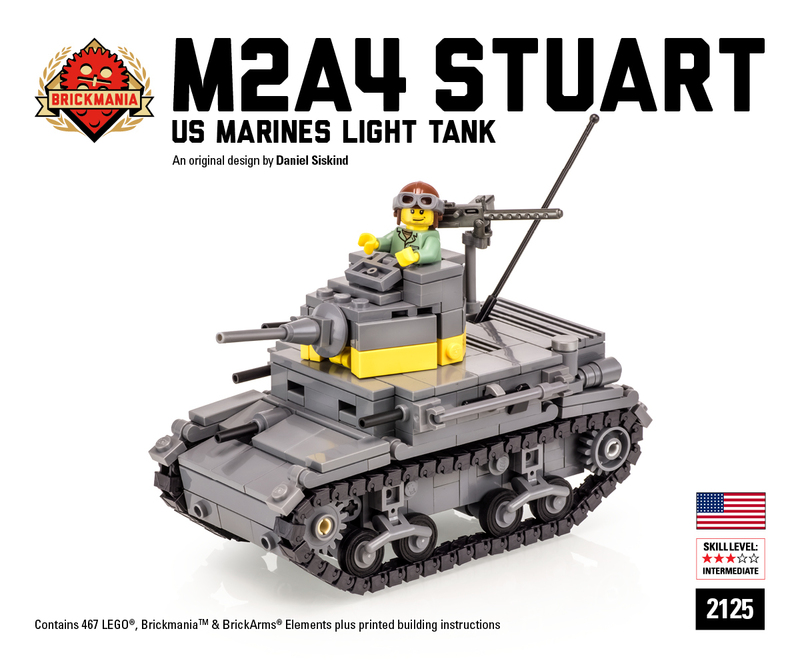 They are a flagship company in the world of military custom LEGO. If we do get to review more kits in the future, then I can't wait:) So, fingers crossed I get to chat to you again about another Brickmania release! Until then, Happy Building! Just heard it will be re released sometime this year! Great review! I understand a lot of people say Brickmania is expensive but the amount time that goes into building them not to mention trying to get all the parts for the kits. They are worth every penny and won't disappoint. Yeah I agree with the lack of stickers/decal part. These little details does enhance the finished kit. The price is definately a road block in getting their kits. I've been eyeing a couple of them, who knows I may just take the plunge. Huge thanks! Keep checking in!